It's a 1998 in Chilly Pepper Red. Last edited by KSIMP88; 06-30-2010 at 09:45 PM. The cat you might need if you have emissions. It may not pass. I have a failing cat on my F150, right now I'm skittering by about halfway up the scale on HC's. Most certainly agree, the ones on it now are hideious. It won't even notice them. It's an OHV inline six made by a domestic company for 40+ years, and can trace it's roots back 70+. It won't care about fancy metals in the plugs. Save your money for the converter and the wheels/tires. Brand new plugs/wire/cap/rotor won't hurt it, but you don't need iridium plugs in it. The standard ones work fine. Get one that supports a snorkel if your jeep is 4WD. My suggestion would be to look at Borla or Magnaflow. Flowmaster 40's sound AWESOME on inline sixes like what your Jeep and my Ford have, but they're known for being restrictive. Sometimes moreso than stock. Still, a good quality Borla or Magnaflow muffler will make that thing sound awesome. Replace the cat with a high-flow piece and put some longtube headers on it, get some mandrel-bent tubing and you'll gain 30HP, easy. It's not noticable. just worn a bit. Really? I'd hope to at least get a fuel economy increase, which is my main goal. Better spark = more efficient. Forgive me, but: LOL WUT? No, these types of engines won't care about fancy metals in the plugs. If you want them to get good mileage, just give them good quality plugs, keep them gapped properly, keep the air filter clean(the K&N will help a ton), keep the oil changed(Valvoline + Purolator filters for me), ensure the ignition system itself is firing properly and drive it right. Mine will hit 18-19MPG on the highway, out of 5 liters. Your 4.0 will get 22-24MPG highway if everything lines up right. Yes. you do. You must gap the plugs if you want this jeep to run worth a damn. That engine is by no means 'modern', when it first came out it did so with contact points and a restrictive 1bbl carburetor. They don't even use contact points on weedeaters anymore, some of those have electronic ignitions. But even in a modern car you must gap the plugs if you want it to run worth a damn. If you don't, it will fail emissions, get horrible fuel mileage, be a pain in the rear to start, eat spark plugs, and may even get a propensity to misfire if the gap is too big or too small. Trust me there's a HUGE difference in an engine with properly gapped plugs V one with poorly gapped plugs. I used to have a 200SX. 1996, black, 5-speed, but otherwise identical to Retro's. Same weak little four banger, too. One day I volunteered it for a compression test lesson at the high school auto shop. When I pulled it's plugs out, I found them to have gaps ranging from 0.085" to 0.100"! I regapped them to the spec(0.045") and it felt like I had replaced the entire engine. 30 HP materialized out of nowhere, started way easier, and got even better mileage than it did. I didn't even replace the plugs, merely regapped the ones it had in it. When I changed the plugs in my F150, the old ones came out with an average gap of 0.055". The new ones went in at 0.032"(spec is 0.035"), and again it felt like I replaced the whole damn engine. I also went from 12MPG average to 16MPG average, overnight, because of both the new plugs/cap/wire/rotor and the fact that the gap was back where it should have been. I also got a smoother running engine out of the deal, because the previous owners never replaced #6 plug(It was checked to be at 0.075" gap, and was noticably more worn than the other 5). Seriously, gap your plugs to the correct spec, it will feel like a whole new engine if the old ones are out of gap. Also, remember that plugs are NEVER gapped properly from the factory. 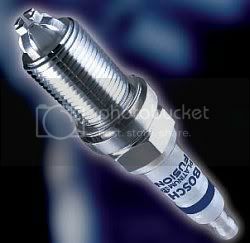 You might get the odd one that lucked out at the right spec, but keep in mind when they make spark plugs, they do not gap them. They solder on the electrode, throw it in a box and that's the end of it. They expect the person installing the plug to set it to the correct gap for the engine it's going in. Does the same thing for your engine as it does for that fat guy. I'd expect someone from Oregon to know what a snorkel is, on account of the amount of people up there who buy them just so they don't stall out when the roads flood in the spring. Last edited by Kenny McCormick; 04-14-2010 at 02:32 AM. That seems like a bad idea. All that cold air during the winter would damage the engine, if it's not heated quickly. Ice would get in. It won't hurt the engine at all. The air gets heated before it gets into the engine no matter where the external source is, as the air coming into the airbox is the same temp either way. Not only that, but your 4.0L is NOT crossflow(Air/fuel comes in the same side the exhaust comes out), so the heat from the 600-800ºF exhaust manifold will float straight up and warm the intake manifold sufficiently to melt any ice that even thinks about forming on your throttle blade. Your engine might even have a coolant passage in the intake manifold to further deter any throttle icing it may have, though I'm not sure it's as important with an EFI engine as it is with a carburetted one. I'd imaigne the threat of icing up is lower since the air isn't sped up as it passes through the system. Icing would be an issue on mine as the air is sped up considerably when it goes through my carb, but again my 300 is not crossflow, so the heat from the exhaust manifold warms the carb up enough to prevent icing. The intake and exhaust manifolds are actually bolted together to ensure this heat transfer occurs. Yeah i'd put a snorkel on as well. When i have 4WD i'll get one on the blazer.